He was involved in a night time helicopter training mission on Feb. 03, 2010. This was his 32nd birthday. The blackhawk went down and killed all three on board. He was a pilot and his command pilot CW4 Gary Farwell and crew chief, Cpl Matthew Clark all perished. The investigational cause of crash, was undetermined. They could find no pilot error, weather could have been factor (but not conclusive due to post crash fire, any icing would not be visible), nor mechanical problems. My son, Clayton Hickman was a son any mom would be proud of. He wasn't perfect, but none of us are. He set goals for himself, and was determined to meet those goals. The biggest goal was to become a pilot. He joined the United States Marine Corps and served 9 years, while stationed in Jacksonville, FL, his ambition to be a pilot got stronger and he worked again at a private airport to pursue his fixed wing certification. He decided his dream wasn't going to happen while in Marine Corps so he left and joined the Army to pursue his ambition to be pilot He went to Warrant Officer Planning School at Ft. Rucker, AL. He became WO1 so he could continue his dream. He earned his wings in July 2009.. You thought he had just won a lottery. His excitement was overwhelming. The High School Marching Band gave him the discipline (Mom was stern too) to see and dream and become the military person he was. Honorable, giving of self and sacrifice to benefit others, He will always be my hero. He was a loving, caring person. He loved people, and animals. He loved his children, more than life himself, and his pursuit of his dream was to benefit his children. He was divorced in March of 09, but he would do without so his children were provided for. 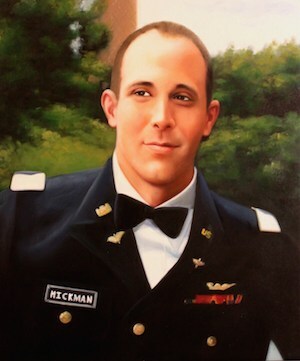 We were approached by a gentleman on Feb. 03, 2011 during the dedication marking the highway we live on a (CW2 Clayton Marshall Hickman Memorial Highway) about the portrait. I am sorry I can't remember his name.